Hotel des Arts is located in the centre of Paris, in the Montmartre district, a 10-minute walk from the Sacré-Coeur Basilica. It offers soundproofed rooms and free Wi-Fi access. Each room has simple décor and is equipped with a TV and a private bathroom with a hairdryer. Some rooms have a view over Montmartre and the roofs of Paris. A buffet breakfast is served daily at the Hotel des Arts in the dining lounge. Room service is available upon request. A 24-hour front desk with concierge service is available. All rooms are accessible by a lift. The Hotel des Arts is just 100 metres from the Moulin Rouge and close to the Place du Tertre, made famous by generations of artists. Both Metro Abbesses and Blanche are 350 metres away, giving direct access to Concorde and Pere Lachaise. Since 3 generations, the Hotel des Arts is a family hotel. Every year the hotel is renovated in order to offer the best service and quality to our guest.It is like home ! Metro station : Blanche Line 2, Abbesses Line 12. From the airport : RER B to Gare du Nord and then Metro Line 2 to Blanche. From Gare du Nord : Line 2 to Blanche. The breakfast room is a charming place with paintings. This room features a TV and free Wi-Fi access. 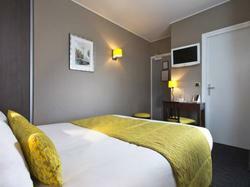 The en suite bathroom includes a hairdryer and some of the rooms have a view over Montmartre. This room features a TV and free Wi-Fi access. The en suite bathroom includes a hairdryer.